Pure sine wave exactly duplicates household current. Very rugged and reliable, CE tested, NAFTA eligible. Suitable for operation with lead acid, sealed lead acid, 3 cell lithium ion and 4 cell lithium iron phosphate batteries. The inverter is protected against condensation and are enhanced with vibration protection that meets or exceeds MIL-STD810F, Method 514-3 and Cat-1 Proc 1. C.O.T.S. products are designed to meet EMC radiated and conducted emissions MIL-STD 461E. 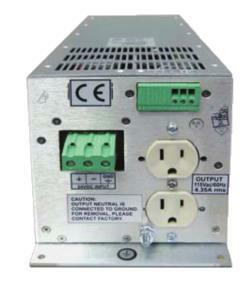 Manufactured in accordance with COTS standard IPC-A-610. Isolated, can be used in positive or negative ground applications. Suitable for any computer that requires less than 500VA continuous. Warranty* 2 years *Warranty depends on installation within good engineering practice.